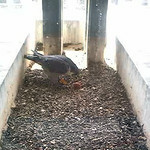 Last night (29-Mar-31) at 11:33, Evanston adult female Nona laid her first egg. Thanks to Deborah for sending email with the good news. Falcon cam watcher ebonykat posted a video of the event. Congrats, Evanston!